In this Person of Marvel we’re exploring hope, courage and positivity with Billie Bacall. Within the space of a few months Billie experienced the sudden death of her spouse, underwent major surgery and embarked on a course of chemotherapy for ovarian cancer. 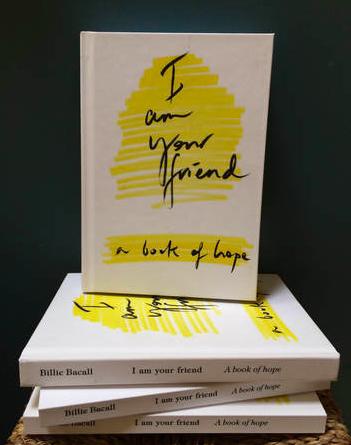 Billie turned to illustrating her thoughts to cheer herself up, and a few years on these doodles have been self-published in the form of a book entitled I am your friend with the aim of helping others to elevate their spirits in such moments. We speak to Billie to explore the intangible necessity of resilience, how to remain hopeful and optimistic when facing hardship and on creativity and hope. 1) (How) can you teach positivity? Life is about perception, and regardless of my recent circumstances I believe I’m the luckiest girl in the world! Others may not perceive my life that way, but it’s all about how you choose to look at the world. I don’t think positivity is something you can teach, in fact – it’s more about discovering a reconnection with what is already within. You can heighten your awareness and reconnect with inner positivity by surrounding yourself with positive friends / great music / being mindful of what you eat / read / think. Consume the good stuff, and in time it’ll build up into a positive life experience! 2) Do you think people need to go through a painful period in order to strengthen their resilience? It’s hard to answer for others, but I have personally always carried a bank of inner strength like a reservoir - available when needed. I have always been a tenacious and determined person and I learnt early in life never to give up on what I wanted. 3) Do you think humans are intrinsically optimistic or negative? Optimistic – that is the essence of human nature, people just need to engage with this side of themselves a little more. 4) I wholeheartedly agree that we must learn to love the process - not the end goal. Do you think (with society as it is) we will ever learn to love the small things - and not crave the Instagram faux-reality? I think Facebook / Instagram will fade away in due course and life will exist again without them. No-one seems to use Facebook much anymore and 10 years ago it was massive. It’s sad that people don’t notice the small things because they’ve got their heads in a phone. I guess each generation has different sensibility and this is a tech driven one. 5) Did you find the process of creating the words/ illustrations cathartic? We are big believers in the healing powers of creativity. How can we pass this on to others? Creativity is everywhere and within everyone – you don’t need be Leonardo Divinci to sit down with pen and paper. Just let yourself flow and go with what feels creatively natural to you. Society is too results based which actually paralyses many. Just allow yourself time to get into the process…whatever that may be. 6) Steve Jobs said “You can't connect the dots looking forward; you can only connect them looking backwards. So you have to trust that the dots will somehow connect in your future.” How can we remain optimistic in darker times and see the end of the story we want? Ah, well - that’s the point! Life is a mystery and we are fools to believe otherwise. We don’t have control over the big picture – there are too many factors involved. It’s better to just let go of that concept and embrace a bit of R & R. Release the need for control and go with the flow. 7) How much do you think we’re in control of our own destiny? Do you believe in - ‘what you believe, you become’? Who knows if we are in control. I doubt it personally - our ego demands we are, but life is stronger than us. At the end of the day we are just a speck in a moment of time. So how then can you then balance that scenario with your own feelings / desires / intellectual thought process? I know the best things that have ever happened to me my whole life have been surprises – good ones… no control in those equations! 8) Do you think we’re in a post-wellness era? With so many positivity quotes on social media is it washing over us? How can a consumer know what to believe?! Not at all. We live now in the 21st century surrounded by tech / demands / fast moving life. I think yes, there is far too much “stuff” out there. Loads of people who have no real background / training in their specialised field are posting perhaps with many “ followers” on Instagram. Now that’s where you get into murky waters. You do have to be careful where you put your attention these days with social media. I believe there’s around 95 million posts a day on Instagram - that’s overwhelming! Choose well…. 9) You talk about small pleasures - hot bath, cup of tea- do you have a list of these you could share with people in a low ebb? · There’s something about making a hot chocolate on the cooker – it’s a ritual and you really feel you’re looking after yourself when u make it - and make it well!